This HUGE kit has everything you need to make an advent calendar for your home or classroom (**or for a commercial product if certain criteria are met as mentioned below), plus all the individual pieces can be used for other creations! It has the special feature of a burlap texture on the stockings, wood frames, and bows (although the bows are also offered in a non-textured version) to make them a little bit unique! This set contains a whopping 120 images in total including 69 color images and 51 black and white. 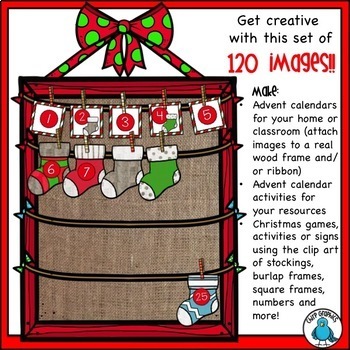 If you are making an advent calendar for your home or classroom, the color images of the stockings and number cards can be printed and then attached to a wood frame using ribbon and clothespins, or just hung on a ribbon attached to the wall. You may choose to set up the calendar cards with Christmas jokes, act of kindness, or fun holiday activity written on one side. 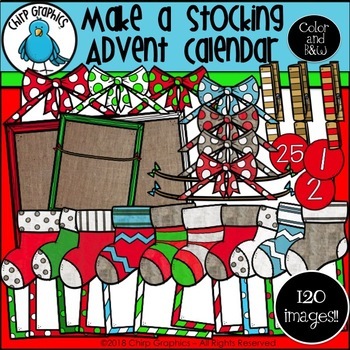 You MAY create an advent calendar resource for sale but only if you have added your own ideas and value to it (i.e., if the advent calendar is set up on a printable worksheet with activities for students related to adding the calendar numbers each day whether that be jokes, riddles, math problems, tracing Christmas words, etc.). **Get this set as part of my CHRISTMAS CLIP ART VARIETY BUNDLE #1 which is now available at a super saver discount HERE! If you like freebies, contests, and getting things on sale, connect below! ©2018 Chirp Graphics. All Rights Reserved.